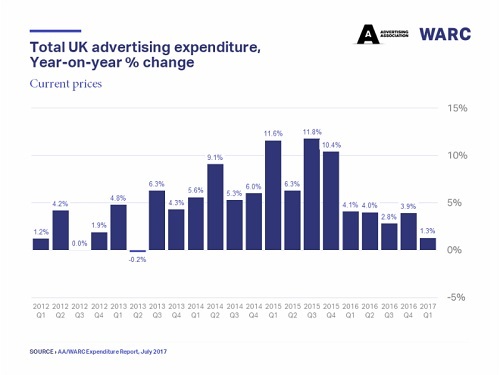 LONDON, Jul, 27 2017 - (ACN Newswire) - UK advertising expenditure grew 1.3% year-on-year in Q1 2017 to reach GBP 5,318m - the 15th consecutive quarter of growth but the slowest rate in almost four years, according to Advertising Association/WARC Expenditure Report data published today. Overall market growth occurred despite a drop of -6.2% in total television advertising, its steepest fall since 2009. 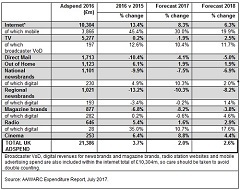 However, TV ad expenditure is forecast to recover in 2018 with 2.5% growth. Digital formats performed well across the board, up 25.4% for national newsbrands, 8.1% for radio, 7.2% for broadcaster video-on-demand and 27.6% for out-of-home. Cinema recorded an outstanding quarter, growing 27.6% year-on-year in Q1. Ad spend growth continues to be driven by internet (+10.1% year-on-year), which includes digital revenues for newsbrands, magazine brands, TV and radio broadcasters. Within this, spend on mobile formats (+36.2%) was particularly strong during the first quarter. 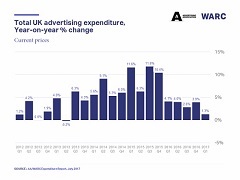 One in four pounds spent on advertising in the UK now goes towards search. "As business sentiment suffers, it's no surprise to see ad-spend come under pressure - but the market overall remains resilient. Beyond these numbers, our sector is a huge source of inward investment and exports and should be a priority for Government as we focus on business beyond Brexit." James McDonald, Senior Data Analyst at WARC commented: "The latest data show that large retailers - particularly supermarkets - and major food brands reined in their TV spending by 25% during the first three months of 2017, instead committing to cutting prices on the shelves as household expenditure wanes. "Higher inflation and slow wage growth has put a squeeze on consumer spending, while business confidence has weakened following the unexpected and indecisive general election result in May. 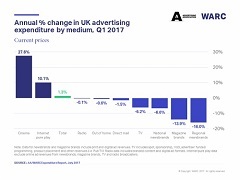 These underlying stresses have resulted in a downgrade to our full-year expectations for UK ad market growth, almost all of which will come from digital formats." The full year outlook for 2017 has been downgraded by -0.5pp to 2% growth, but is forecast to recover by 2018 at 2.6% growth, driven by the men's football World Cup and a likely improvement in certainty around the terms of Brexit. 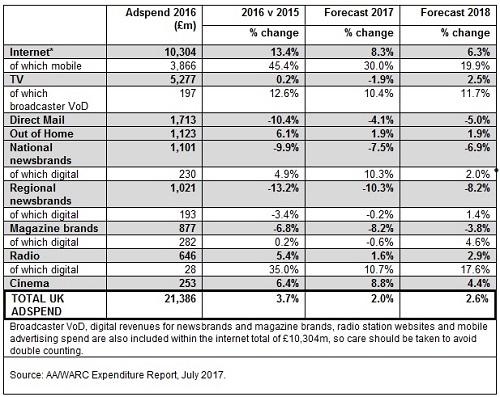 Internet adspendrose 10.1% during Q1 2017, mainly driven by mobile which experienced a 36.2% year-on-year increase in spend. Television adspend dipped by -6.2% in the first quarter of 2017, with a decrease of -7.2% for spot advertising. Total TV spend is expected to dip -1.9% this year, before the losses are regained in 2018. Radio adspend dipped -0.1% despite an 8.1% increase for digital ad formats during the quarter. Out of home (OOH) spend contracted by -0.6% year-on-year during the first three months of 2017, despite a 27.6% rise in digital ad expenditure. National Newsbrands' combinedad revenues fell-6.6% during Q1 2017. However, this was the industry's strongest performance in two and a half years, with digital (up 25.4% year-on-year) now accounting for just over a quarter of ad revenue. Regional Newsbrands' ad income dropped across print (-18.8%) and digital (-2.7%) formats in the first quarter of 2017, with combined revenues down -16.0%. Magazine brands recorded losses in income from both print (-16.1%) and digital (-8.9%) ads in Q1. Cinema adspend rose 27.6%, making it the only non-digital medium to grow during Q1 2017. Direct Mail adspend was down -1.5% in Q1 2017, 7.5 percentage points better than forecast. The Advertising Association promotes the role, rights and responsibilities of advertising and its impact on individuals, the economy and society. We are the only organisation that brings together agencies, brands and media to combine strengths and seek consensus on the issues that affect them. Through wide-reaching engagement and evidence-based debate we aim to build trust and maximise the value of advertising for all concerned.